A giant Antonov An-22 military cargo plane has crashed during training in a rural area of Russia's central Tula region with the loss of 12 air crew. The ageing Soviet-era turboprop plane, one of the biggest in the world, may have suffered an electrical failure, Russian media report. 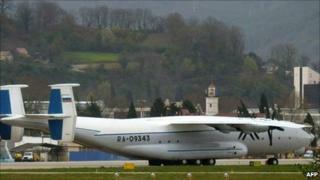 It had been flying empty from Voronezh to Tver when it fell late on Tuesday. As a precaution Russia has grounded all its other An-22s as well as Tu-95MS bombers using the same engines. Built in 1974, the crashed plane is believed to have been one of only five An-22 cargo planes still in service with the Russian military. Also known as the Antaeus, the An-22 can carry 60 tonnes of cargo and 300 soldiers with infantry weapons or 151 paratroopers. The plane took off from Voronezh about 2100 (1800 GMT) on Tuesday en route to Migalovo airport in Tver. It vanished from radar screens shortly afterwards. Eyewitnesses in Tula reported hearing a loud explosion. Wreckage was found scattered in a field 4km (2.5m) from the village of Troitskoye, where the impact left a crater 5m (16ft) deep, military prosecutors told AFP news agency. Blizzard conditions hampered the search for the wreckage but first reports did not speak of bad weather as a factor in the crash, with the lenta.ru news website saying the main theory initially was an electronics failure. Moscow military prosecutors have opened an investigation into the accident under an article governing violation of air transport and safety rules.